NIAMEY (Reuters) - Troops from Chad have driven Boko Haram fighters from a northern Nigeria border town seized by the Islamist militants late last year, military sources stationed in neighbouring Niger said on Thursday. Chad's involvement in retaking the town comes as the regional military heavyweight assumes an increasingly aggressive role in combating the militants and regional leaders weigh new options for containing the movement's spread. Boko Haram, which has killed thousands in its struggle to create an Islamic state in northern Nigeria, seized the town of Malam Fatori in November, sending government soldiers stationed there fleeing across the nearby border into Niger. 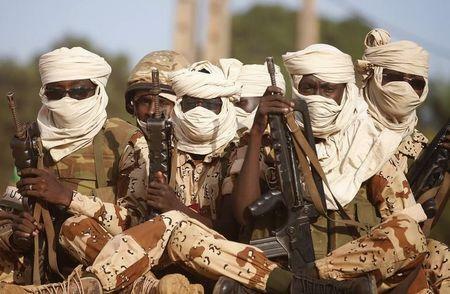 "This morning the Chadians retook Malam Fatori. There were clashes with Boko Haram that lasted over 24 hours," said a Niger army officer deployed to the adjacent region of Diffa. "There were combat aircraft but we don't know their nationality." A second officer said Chadian troops began massing on the shores of Lake Chad last week before crossing into Nigeria on Wednesday to retake Malam Fatori. Nigeria's defence headquarters tweeted that Nigerian Air Force aircraft had been involved in two days of air operations over the town though it did not confirm Malam Fatori had been retaken or directly acknowledge the presence of Chadian troops. "(Malam Fatori) is within the area of operation covered by the Multinational Joint Task Force of which Chad has always been a part," the defence headquarters' official Twitter account said. Chadian officials were not immediately available for comment. The four nations of the Lake Chad Basin - Cameroon, Chad, Niger and Nigeria - agreed to bring their forces together to fight Boko Haram in October, together with a contingent from Benin, which borders Nigeria to the west. But disagreements surfaced over how to deploy the troops and a cohesive fighting force has failed to materialised. Meanwhile, Boko Haram, which has expanded their zone of operations over the past year most notably into northern Cameroon, has stepped up attacks in the run-up to Feb. 14 elections in Nigeria. After Cameroonian President Paul Biya appealed for help to fend off Boko Haram, Chad sent troops, armoured vehicles and attack helicopters earlier this month to assist the thousands of Cameroonian soldiers already deployed to the border. The African Union on Thursday endorsed a West African plan to set up a regional task force of 7,500 to fight Islamist Boko Haram militants, a senior official said, in a vital step towards securing U.N. Security Council backing. Chad Is Worried His Memory Is Gone from "Week Six"